Sheridan's Small Congregation Reaches Out to Community » In the historic town of Sheridan, Wyoming where the Old West still casts its charm and cowboys meet over coffee, the small country Seventh-day Adventist Church with some 30 attending members is holding an evangelistic series for its community, a community of more than 18, 000. Meeting six days each week for three to four weeks, RMC president Ed Barnett, lay members, Diane Larkin, Linda Kelly, and Bob Pooley, along with Pastor Chuck Gadway present the gospel to the nearly 20 visitors, a number that almost doubles their current attendance. The members are “very loving and caring,” comments Barnett, who didn’t want to spend time doing evangelism if the members weren’t going to welcome new people into the family. Two have already asked to be baptized and Barnett believes that number will climb to five by the end of the series. The Sheridan pastor “is a real evangelist, a great preacher,” said Barnett of Chuck Gadway who pastors not only the Sheridan Church, but also Gillette, Buffalo, Newcastle, and Upton. 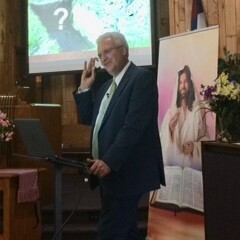 During the Sheridan gatherings, the first six meetings presented the primacy of Jesus Christ, explained Barnett, and went on to cover prophecies and a number of Adventist beliefs. “It’s not enough just to love Jesus,” he continued, quoting the verse from John 14:15 which says, “If you love me, keep my commands.” Accepting Jesus means that our life will change and our love will manifest itself in the way we live. With the goal of presenting two evangelistic series each year, Barnett is already booked through 2019. Newly-Trained Volunteer Team Successfully Wraps up Effort for Colorado Springs » Volunteers are crucial to making Adventist Community Services Disaster Relief successful. A recent fire in Colorado Springs has proven that. 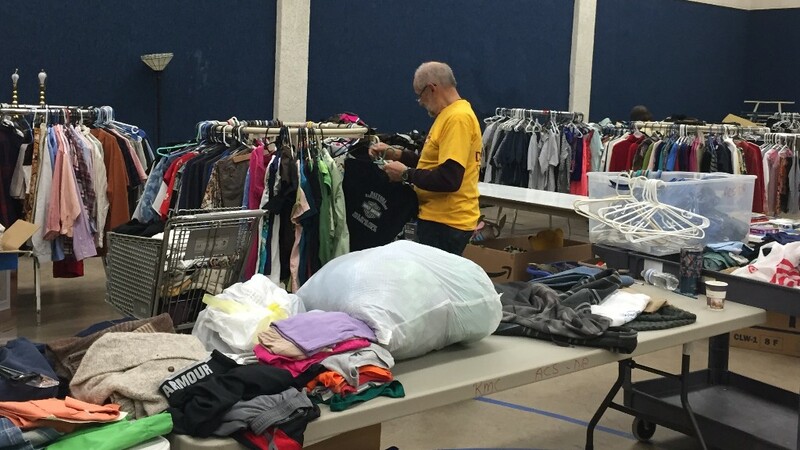 Named advisor for the Colorado Springs Adventist Community Services Disaster Relief (ACS DR) team of volunteers, Kathy Hayden, a member of the Pueblo Church, worked with a team who had never before opened a Community Collection Center nor a Distribution Center. Thankfully, they had been trained in donations operations just the weekend before the fire. Set up in the gymnasium at Springs Adventist Academy, the Collection and Distribution Center was used each weekend by other groups which posed a potential conflict. Both the Sabbath group and the Sunday group, however, believed that ACS was doing good work and shouldn’t have to move their set-up each weekend. The groups were happy to use one side of the gymnasium to make room for ACS, even though that included Easter weekend. One councilwoman from Colorado Springs held them in extreme reserve, not sure they would know how to take care of her people, but the staff she sent to check them out were amazed at how organized and nice it was, according to Kissner. “The City of Colorado Springs now realizes what we can do during a disaster,” she commented. “The team worked so well together to meet the needs of those impacted by the fire and showed the love of the Father to those in need. This was their first event and they were amazing,” said Cathy Kissner, RMC Director of ACS. Set up March 29, the Collection and Distribution Center helped 54 families, giving out 6,597 items during their 14 days in operation. When they closed on April 11, the volunteer hours had reached 728. Introducing Camp Season at Glacier View Ranch and Mills Spring Ranch » More than 600 campers spend a week at Rocky Mountain Conference’s camps each summer where, according to youth director Steve Hamilton, “they have time to experience life in a way that seems as if the clock has slowed down”. With time to experience nature and learn about the Creator’s love, camp counselors and other staff want the sights and sounds of nature and worship to be imprinted on their minds and hearts. They want their experience to be so impactful that it continues to affect the way they live their lives. This sounds idyllic, but new regulations by Colorado’s Child Care Licensing is causing some frustration. With this new restriction, camp staff must have camper medical files in hand ten days prior to the camper arriving at camp. This means that campers can no longer register up to the time their camp begins and are not able to invite friends to register beyond the ten-day limitation. Another frustration is the youth labor law. Typically, we hire 13 entry-level positions during summer camp at Glacier View Ranch, which include kitchen, housekeeping and maintenance. Camp leaders have valued the opportunity these positions provide as they are a great place to start in camp ministry, giving students the opportunity to experience camp leadership. Workers could begin while in high school or academy and work their way into positions that interest them during their college years. This year, they are no longer able to hire 16 and 17-year old students unless they have graduated from high school. The stringent labor law makes it difficult to hire students while they are in academy, which has created a staffing crisis this year as certain positions, especially kitchen workers, are desperately needed. In the future, they hope to implement a work-study program which will allow 16 and 17-year old high school students to work at summer camp. When I was in college, the sporting world was a-buzz with the name "Roger Bannister." Bannister was a medical student in the UK, but his passion was running. At 6'2" and 154 pounds, he seemed to have the physical equipment for running, but more than that, he had the resolve. Bannister's obsession was to run a mile in less than four minutes. Though runners had chased that goal for decades, the then-current world record was just over four minutes, set nine years earlier. Pundits assured the world that no one would ever run a sub-four minute mile because the human body was not capable of sustaining that level of physical exertion for that period of time. Bannister believed they were wrong and set out to prove it. Late on a cloudy afternoon, May 6, 1954, 25-year-old Bannister and five other athletes readied at the starting blocks on the track at Oxford University. Three minutes and 59.4 seconds later, Roger Bannister collapsed, fully spent, into the arms of his handlers, the first person ever to run a mile in less than four minutes. The sports world went crazy. Later that summer, he would race again and shave three seconds off his record. Roger Bannister died March 8, 2018 at the age of 88. He had become a famed neurologist, but also the victim of advanced Parkinson's disease complicated by disabling injuries received in an automobile accident. However, that is not the end of the Bannister story. When the athletic world discovered that the human body could run a mile in less than four minutes, others began to attack that summit. Since then, more than 17 seconds have been shaved off the record which now stands at 3:43:14. But here is the astonishing face: a total of 4,518 runners have broken the four-minute mile since Bannister's record, including more than a dozen high school students. Here is my take-away: Many victories are never claimed if we can't bring ourselves to believe they're achievable. What might happen if we trusted the Coach and His promise that "nothing is impossible?" Might His goal be that your church make a significant impact on your city? Might His goal be standing-room only when your congregation gathers? Might His goal be that your church become a force for the changing of lives . . . scores, hundreds? What do you believe is possible for your church? Are you satisfied it matches His goal? Love Reality Tour Comes to Grand Junction » Join the Love Reality Tour at 6:30 - 8:00 p.m., April 18-21, at the Grand Junction Church. The Love Reality Tour seeks to communicate a lifestyle of IDENTITY, PURPOSE, and WORTH rooted int he Love of the Father. Our IDENTITY is secure in our standing as sons and daughters of God through our adoption as children. Our PURPOSE is to manifest God in love through the Spirit. Our WORTH is equal to the value that the Father placed on us when He gave His only Son. To live and move from the confidence that we are sons and daughters with immense value is to live a life of meaning and freedom; a life in His LOVE REALITY. "Behold, He Comes" Concert, April 21 » With trumpet lifted high, the Denver South Church choir, orchestra, and community friends will offer a spiritually-uplifting concert at 7 p.m. Saturday, April 21 at Denver South Church. "It's exciting to see church members and friends take initiative by creating an event that will welcome participants to use their gifts and impact attendees in a positive way," remarked Denver South pastor, Christian Martin. Enjoy a small foretaste of the greatest event to come with beautiful spiritual music taken from diverse genres in a poignant and relatable message with heart-touching drama. For more information, contact Missy Wherley at 720-985-8949. Next Step in Donations Management » Adventist Community Services leadership will hold a seminar from 10 a.m. to 4:30 p.m. Sunday, April 22 at HMS Richards Elementary School (on Campion Academy campus). The next step in your community services training is a simulation of a Community Collection Center, a Distribution Center and a Multi-Agency Warehouse. Bring one non-perishable food item or personal hygiene item to use in sorting practice. At the end of the day, these items will be given to the Loveland ACS Center. If anyone you know is interested in ACS DR work, please invite them. RSVP to Cathy Kissner at 970-201-3799. She needs a head count for number of potatoes to bake. Lighthouse Christian School » You Are Invited to attend the Fort Morgan Lighthouse Christian School registration, spring program, and open house at 6:30 p.m. on April 25. The spring program, "Grandpa, Tell Me About the Farm," is a patriotic musical featuring Colorado historical events, as well as a tribute to farmers. The evening will conclude with K-8 registration and open classrooms with displays of student portfolios which will include science reports, STEAM projects, brochure designs, and computer coding projects. Open to everyone--school families, veterans, farmers, or anyone who simply enjoys watching children's musicals. Come help us honor our country, our God, and Seventh-day Adventist Christian education. Scheduled from Friday, April 27 through Sabbath, May 5, all meetings are at 7:00 p.m. except for the two Sabbath morning services. Everyone is welcome to attend. Children's Ministry Certification » From 9 a.m. to 7:00 p.m., on Sabbath, April 28, those interested in children's ministry have the opportunity to become certified. NAD speakers will present Track 2 -- Teaching Children: Teaching Children, Teaching Sabbath School, Teaching Nature, Craft Lab, Interactive Storytelling, Disciplining with Grace and Love. Children's Praise and Worship, Active Learning. They will also introduce Vacation Bible Xperience 2018. The cost is $25. Register online at http://rmcyouth.org/children or contact Kathy Swelstad at 608-852-6059 for more information. ¡La Pasión de Cristo eres Tu! » Una cordial invitación al Seminario Biblico ¡La Pasión de Cristo eres Tu! Viernes Abril 27, 7:00 p.m., Todos los Lunes, Martes, Jueves y Viernes hasa May 11. 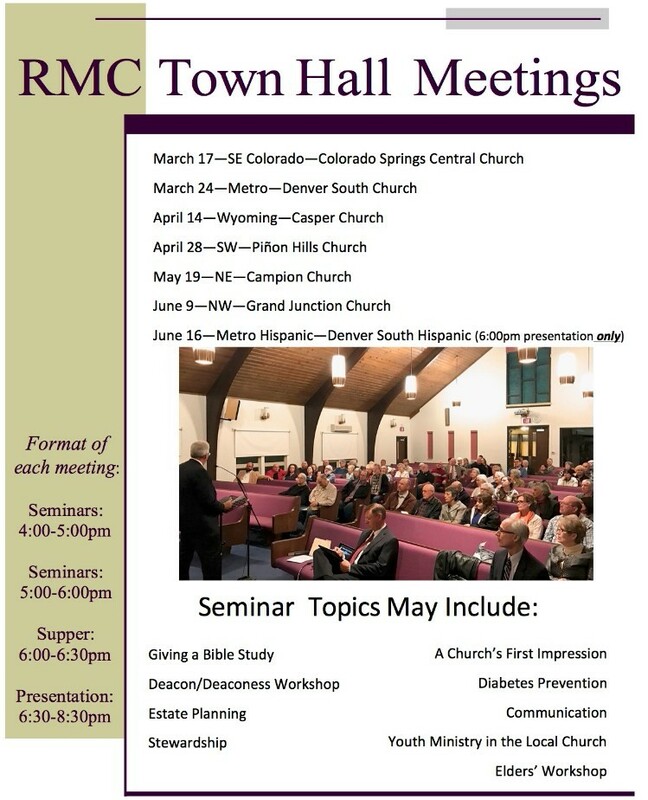 Såbado Mayo 5, 10:45 a.m. y 7:00 p.m.. Såbado Mayo 12, 10:45 a.m. Iglesia Vista Seventh-day Adventist Fellowship, 701 Kimbark Street, Longmont CO 80501. Descubriremos a través de la Biblia el verdadero significado del Amor Divino. Su palabra nos enseña que en Cristo hay felicidad, pas y esperanza. Fort Collins School » The Fort Collins Christian School will start a state-licensed Preschool (ages 3-5) and is seeking a part-time preschool teacher for the 2018-2019 school year. Candidates with a Bachelor’s degree in Early Childhood Education, Elementary Education, Special Education, Family and Child Development, Child Psychology, or an Associate Degree in Early Childhood Education will be considered. If you are interested in this position, please contact Keiko Breese at [email protected] or call her at 970-222-6347 for more information. Mile High Academy Needs Third Grade Teacher » Mile High Academy will be hiring a third grade teacher for the 2018-19 school year. We are looking for an individual who is passionate about teaching, a lifelong learner, and has a visible relationship with Jesus.